The Worldviews Network is a pioneering collaboration of scientists, artists, and educators helping communities across the United States to understand global changes and how they affect our lives. Using the power of interactive, immersive visualizations, we are engaging in dialogues about how our collective actions shape the future of our planet. Funded by a three year environmental literacy grant from the National Oceanic and Atmospheric Administration (NOAA), the core team and our partners in science centers and digital planetariums convened communities dialogues about local responses to global change issues. By participating in the Worldviews Network, regional science centers have engaged researchers, members from the private sector, and a host of government and non-governmental organizations. Visit Programs to learn more about these individual events and download relevant resources, or check out Process to learn how to create your own. 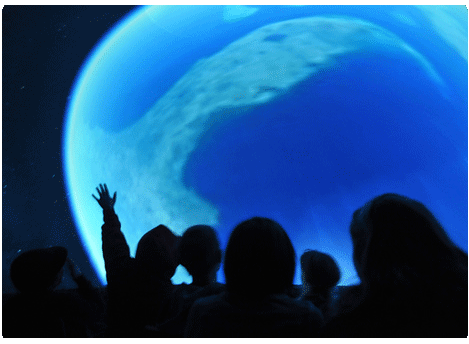 To read more about the project, see The Worldviews Network: Planetariums for Ecological Literacy from May/June 2012 issue of Dimensions magazine (reposted with permission from the Association of Science-Technology Centers). Designed and delivered a professional development process to train partners in the creation of programs about global change issues and techniques for community engagement. Established connections with organizations (NGOs, indigenous groups, public, and private sectors) that will give audiences opportunities for continued engagement. Formally evaluated the impact of our professional development and community engagement programs to better understand how to effectively cultivate ecological literacy. The Worldviews Network is comprised of science centers, planetariums, and institutions across the United States who are helping communities understand how global environmental changes affect their lives. Funded by the National Oceanic and Atmospheric Administration (NOAA) for three years, the Network consists of a core team of designers, educators, technicians, and science advisers represented by 5 institutions and a distributed network of partners representing ten institutions. As the largest natural history museum between Chicago and Los Angeles, the Denver Museum of Nature & Science (DMNS) has brought stories of the natural world to generations of visitors. In 2007, its on-site attendance was 1.25 million, with 220,000 visiting its digital Gates Planetarium, a state-of-the-art theater that seats 115, and is equipped with Uniview running on multiple visualization clusters, as well as an advanced lighting and sound system. DMNS staff and volunteers have considerable experience using visualization software like Uniview and are managing Worldviews productions with the core team to create new planetarium shows and a wide variety of experiences for visitors to the Gates and to partner institutions in the Network. The California Academy of Sciences (CAS) is the oldest scientific institution west of the Mississippi River, and the only institution in the world with a natural history museum, an aquarium, and a planetarium under one roof. The recently rebuilt Academy of Sciences is now the world’s greenest museum and had nearly 2.4 million visitors in its first year of operation. The Morrison Planetariumis the largest all-digital dome in the world with a 75-foot diameter projection screen with 290 seats. Within the Academy’s Visualization Studio, members of the Worldviews Network production team interacts with regional partners and Worldviews science advisers such as Dr. Healy Hamilton. Her lab’s research efforts are directed toward forecasting the ecological impacts of global change on species and landscapes of conservation and management focus, such as Yellowstone National Park and coast redwood forests. The Elumenati is a privately owned design and engineering firm that specializes in the development of compelling immersive display environments. Founded in 2003, its clients include NASA, NOAA, Disney, Cirque du Soleil, NVIDIA, Field Museum, NC Museum of Natural Sciences, the Renaissance Computing Institute, Burning Man, and many others. The Elumenati are developers of the GeoDome, the world’s first highly portable immersive visualization environment designed to comfortably accommodate audiences of all ages. In addition to hardware design, they have pioneered the use of interactive scientific visualization platforms as transformative educational tools, with a particular focus on communicating ecological relationships across bioregional, global and cosmic scales. Climate Program Office Communications and Education Team: NOAA’s Climate Program Office is central to the guidance of the proposed NOAA Climate Service (NCS) by establishing and funding research priorities through competed programs, organization and planning of climate activities throughout the agency, and, most recently, by establishing a Communications and Education (CommEd) team. The CommEd team promotes NOAA’s contribution to climate science and services, helps professionals utilize NOAA resources, and promotes climate literacy through formal and informal education activities in cooperation with other federal agencies. The CommEd team has joined three other offices within NOAA to build a prototype NCS web portal for climate data, products, and services (climate.gov). The CommEd team collaborates with scientists and communicators throughout the agency to supply vetted science content throughout the portal. The CommEd team has designed its objectives, infrastructure, and communication strategy to support other communications professionals with written descriptions, originally produced geospatial data, connections with NOAA scientists, and innovative methods for working with different types of audiences and is therefore well poised to support the Worldviews Network. The Center for Research and Evaluation at the Lifelong Learning Group (Ohio) assisted with evaluating the efficacy of the Worldviews Network engagements. Worldlink (California) assisted with designing the Worldviews Network dialogue facilitation process. This is a very low-traffic one-way list and is only used for announcements of our events.